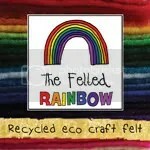 When I first signed up to Folksy I had only just started selling my crafts and hadn’t even come up with a name for myself. 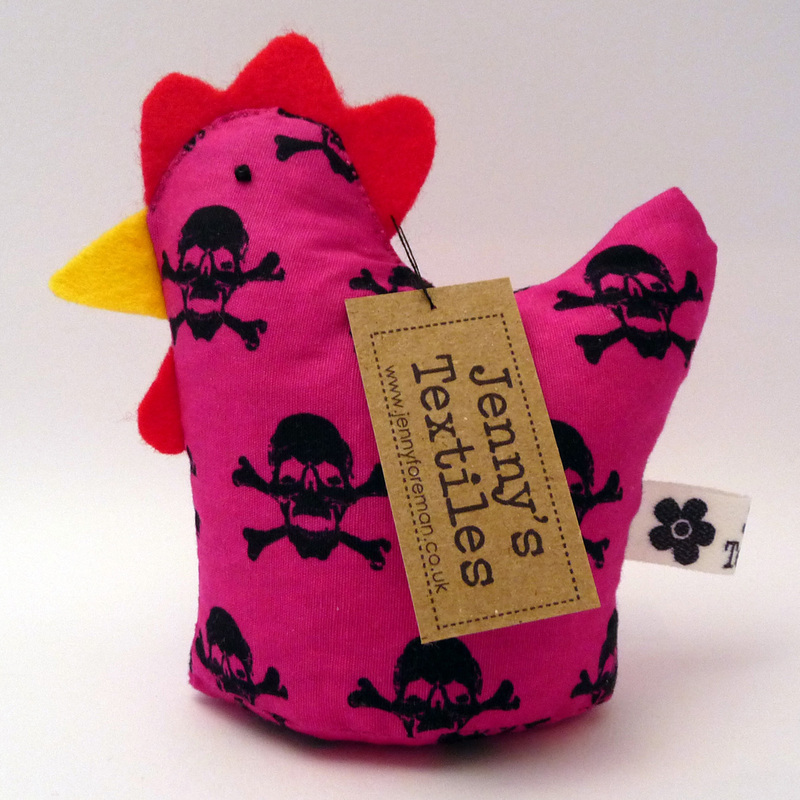 When filling in my details to open my Folksy shop I was unprepared and ended up rushing into deciding to call my little business Jenny’s Textiles. I was never completely happy with this as I felt it limited what I could make and it seemed pretty boring. 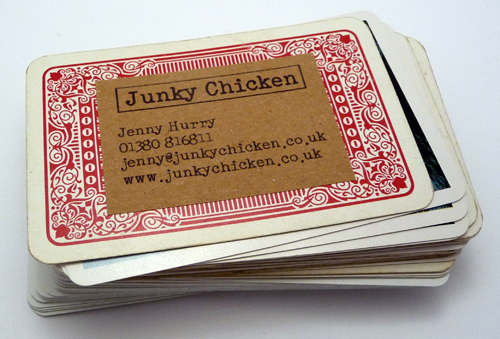 So, about 6 months later, I relaunched myself as Junky Chicken. 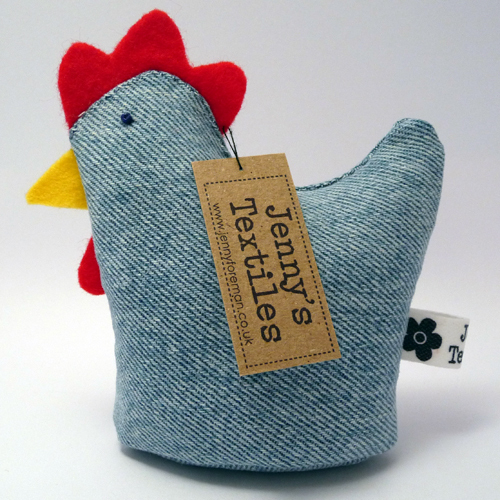 My problem is that now the URL for my Folksy shop is http://www.jennystextiles.folksy.com and whenever I post in the forums it is as Jennystextiles. This is why I now need your help. 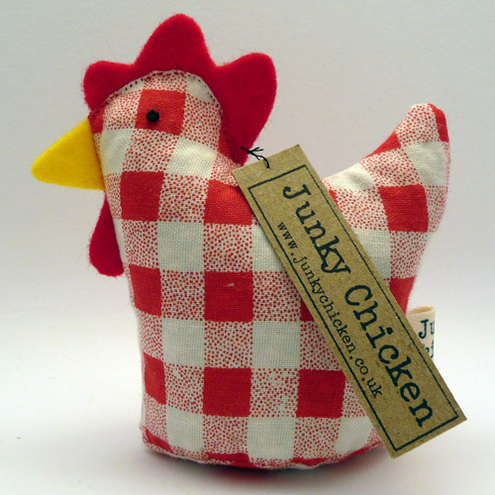 Should I sign up for a new Folksy account with Junky Chicken as my user name? I know how important it is to brand yourself well and to be consistent, and I hate that it must be confusing to customers having what seems to be two different shop names. What holds me back from just changing it is that I have 31 sales, good feedback & 132 people having favourited my shop so it would take a little while to work my way back to having the same in my new shop. I also worry a little about missing out on sales from previous customers/people that have favourited my shop due to them maybe not finding me again. So, I would love if you could all click away in my poll below and help me decide what to do. I would also love to hear any thoughts or advice that any of you might have in the comments. Have any of you done this yourself? Thank you in advance for anyone that helps! This week has been all about chickens here. Starting last Friday when we became the proud owners of two chickens, I then spent most of this week making a load of chicken doorstops & paperweights for a craft fair on Saturday & watching our chickens free-ranging around the garden! So the only fitting theme for this week is, of course, chickens! This chicken is called Sheila and you can get her from Righthand. This Spring chicken bowl is made by Prince Design UK. This Tall & Short Chick mini card has been hand drawn by Fosscards. 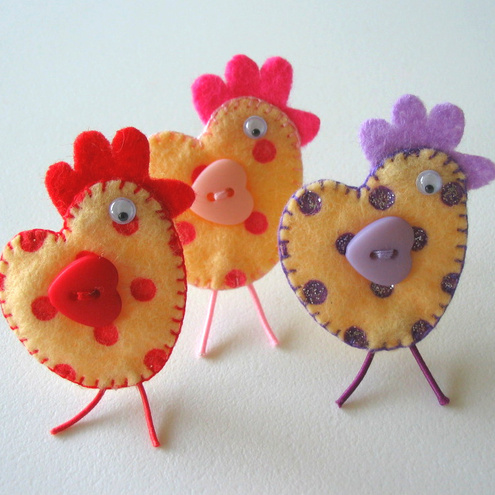 You can get yourself one of these chicken hairclips from Gingy Snapz. I know this is a bit cheeky, but as this post was about chickens I felt it was only fair to sneak one of my own in! 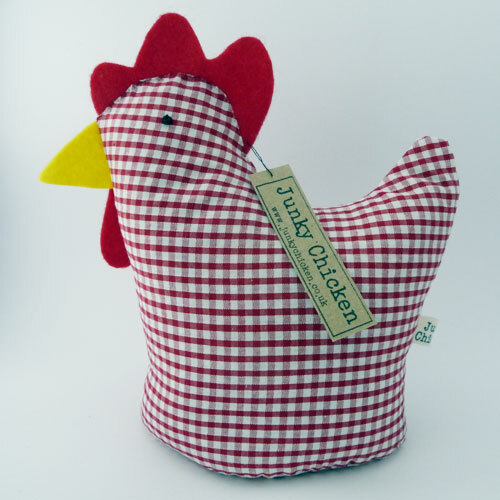 Daisy has now been sold but there should be plenty of chickens flocking to my shop any day now! I hate doing blog posts without pictures so the photo above is of me wearing my amazing coat that Joe bought me for Christmas. It was made by the brilliant Katwise who I’ve blogged about before. Go check out her shop! Featured On Two Blogs In Two Days! 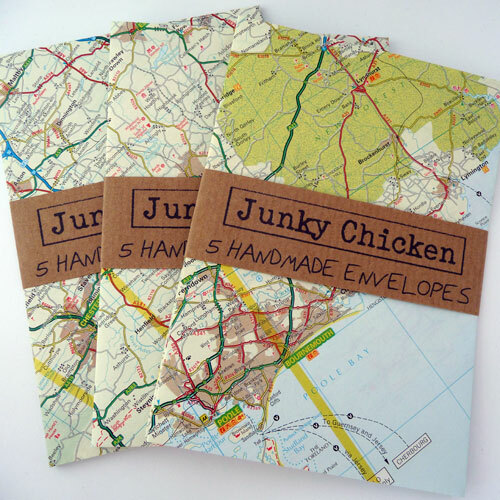 This weekend was a good weekend for Junky Chicken! On Saturday, Dig The Earth wrote a lovely post about the envelopes that I sent to him as his thank you for being the 100th person to favourite my shop. 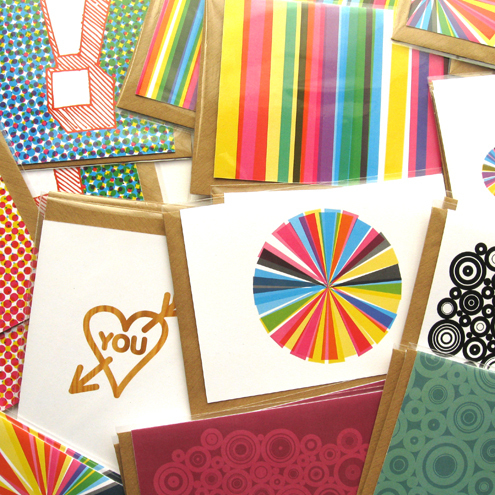 Kev is a fellow user of recycled materials and makes cards using recycled card. Go and check out his shop here, and his blogs here and here. Welcome to my first ever giveaway 🙂 The prize that will be up for grabs is the chance to have your very own chicken paperweight. 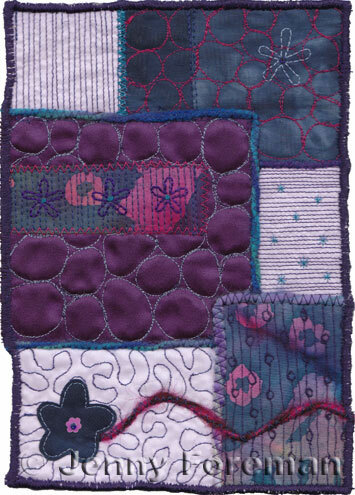 It will even be made especially for you from fabric in your favourite colour. 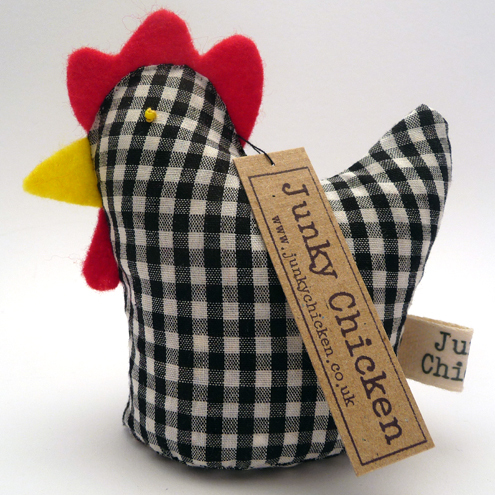 All you have to do to have a chance at winning is to follow Junky Chicken on Twitter, and then leave a comment here telling me who you are on Twitter and what your favourite colour is. If you are already following me then don’t you worry, you can still join in! I will announce who the randomly picked winner is on Sunday 11th October.